A food safety issue causes a temporary halt in the production of hot dogs at a significant number of firms. What is the expected effect on the equilibrium price and quantity for hot dog buns, assuming a perfectly competitive marketplace? Hot dogs and hot dog buns are a model pair of complementary goods. Few people buy one without buying the other. You can graph the situation described using supply and demand curves for each market. In the hot dog market, a significant decrease in supply will result in an inward shift of the supply curve which results in a higher price and fewer hot dogs being bought and sold. The resulting effect in the market for hot dog buns, with fewer hot dogs being sold, is an inward shift in the demand curve, which results in a decrease in both the market price and quantity sold of hot dog buns. If there is a bumper crop in cotton the same year that it becomes very fashionable and consumers begin to demand it over other fabrics, what is the likely effect on the market price and quantity traded? Graph supply and demand curves to represent the market for cotton. The changes described would result in an outward shift of both the supply and demand curves. The new equilibrium would clearly have an increase in the quantity traded, but the equilibrium price would depend on the slope of the curves. Therefore, without more information, the effect on the market price is indeterminate. Sugar can be refined from either sugar cane or sugar beets. Which of the following would result in an increase in the market price of sugar cane, assuming perfect competition? A sugar beet crop failure would result in an inward shift of the supply curve in the market for sugar beets, resulting in a higher equilibrium price. Since sugar beets and sugar cane are substitutes, this would result in greater demand for sugar cane, which would result in a higher price for sugar cane as well. Sugar can be refined from either sugar cane or sugar beets. If there is a larger-than-expected harvest in BOTH sugar cane and sugar beets, what is the effect on the equilibrium price and quantity in the market for sugar cane? Neither Price nor Quantity can be determined from the information given. First, an increase in the supply of sugar beet results in a lower market price, and therefore lower demand for sugar cane, since they are substitutes. This translates into a lower market price and lower quantity traded for sugar cane. Second, the increased supply of sugar cane would result in a lower market price and higher quantity traded in sugar cane. Therefore, the market price would definitely decrease, but the direction of the change in quantity cannot be determined. more of a good and charges a lower price. more of a good and charges a higher price. less of a good and charges a lower price. less of a good and charges a higher price. Unable to determine from the information given. As seen in the graph below, the monopolist faces a downward sloping marginal revenue curve that is steeper than the demand curve. The monopolist produces where MC = MR which results in a higher price and lower output compared to where the marginal cost curve meets the demand curve, which is where equilibrium would be in a perfectly competitive market. If a monopolist's marginal cost curve shifts down, what is the expected effect on price and quantity of the monopolist's output? Cannot determine either Price or Quantity. Although the monopolist will not end up producing at the socially optimal level, the effect of the change described is very similar to a shift in the supply curve in a perfectly competitive market. 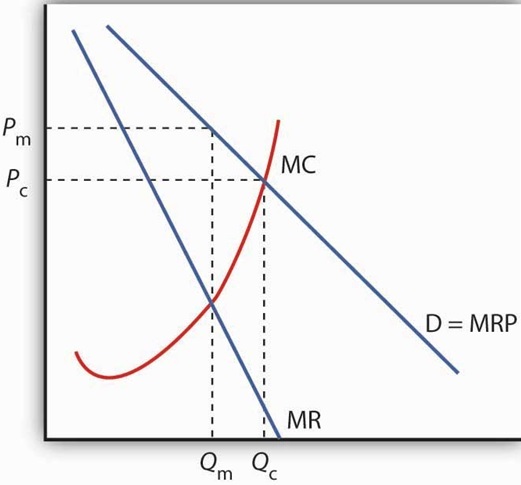 Starting with the graph below as a baseline, you can see that if the marginal cost curve shifts down, the monopolist will produce at a point further along the marginal revenue curve, which would correspond to a greater output at a lower market price. A natural monopoly arises when which of the following characteristics of a perfectly competitive market are not met? A natural monopoly is defined by an industry where production is most efficient (i.e. lowest long-run average cost) when it is concentrated in a single firm. This implies increasing returns to scale, which is not characteristic of perfect competition. In other words, the natural monopolist will have a significant cost advantage over smaller competitors that try to enter the market. A natural monopoly differs from a traditional monopoly in what way? A natural monopoly is very similar to and experiences the same inefficiencies as a traditional monopoly. The difference is that these inefficiencies cannot be corrected by increasing competition, as a single seller can produce more efficiently than many sellers in a market that is a natural monopoly. Assume that each of the following producers operates as a monopolist. Which one is most likely NOT a natural monopoly? The electric company, railway, and telecoms operator are all examples of industries with very high fixed costs where the lowest average cost could only be achieved at a high level output, which discourages competition and is characteristic of natural monopoly. The drug-maker operates as a monopoly due to the legal barrier (patent) that prevents entry into the market (for that specific drug). Therefore, it is NOT a natural monopoly. Assuming the markets for pencils and erasers are perfectly competitive, what is the expected effect on the market for pencils if there is a sudden shortage in the rubber needed to produce erasers? Cannot determine from information given. Since pencils and erasers go together, a higher price for erasers means people demand fewer pencils at any given price. This results in an inward shift of the demand curve in the pencil market. As a result, both the price and quantity of pencils being sold goes down.